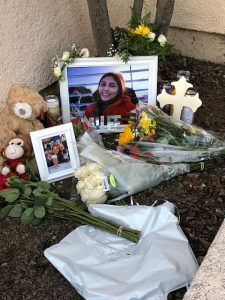 Memorials going up late last week along highway 101 in Templeton and at Paso Robles high school for 17-year-old Emilie Ruiz, who was struck and killed last Tuesday night while walking along highway 101. Ruiz stepped into the right lane of the freeway around 10:50 Tuesday night, she stepped directly into the path of a vehicle. Investigators are still trying to ascertain why Ruiz walked along the freeway and why she stepped into the path of an oncoming car. The memorials along 101 and at Paso Robles high school include flowers, balloons, a teddy bear and pictures of a smiling Emilie Ruiz.